����������� Today's Snack: Let's make some delicious roasted tomato slices! First, preheat oven to 325 degrees. Cover a cookie sheet with foil. Spray with cooking spray. Next, slice one or more fresh tomatoes into half-inch slices. Each student will probably want two or three slices, and you can get 6-8 slices from each tomato. Place them on the foil. Sprinkle with Parmesan cheese and a little Italian seasoning (dried basil, oregano, garlic salt, etc.). Bake for about 10 minutes, or until the tops are golden brown. Eat on a small plate with a fork with a glass of milk. Yummmmm!!!! Here's an unusual and inspiring response by a father to the diagnosis of a serious disease affecting his child's brain and behavior. It's called "autism" and it's on the rise in our country. This dad is fighting back with a very special way to raise money and awareness about autism. And you can help! handle vigorous growth and lots of tomatoes! He has developed his own special kinds of tomatoes. He's sort of like an inventor, only he invented a certain kind of a plant, instead of inventing a machine or a medication or something. Now he is asking people to come to his website, buy his special tomato plants, and grow his tomatoes. And he will give the money to researchers who are trying to cure autism. The name of his operation: The Online Tomato Vine. You can order one or more plants through the mail to grow in your own garden, and help him and the kids who have this disease. 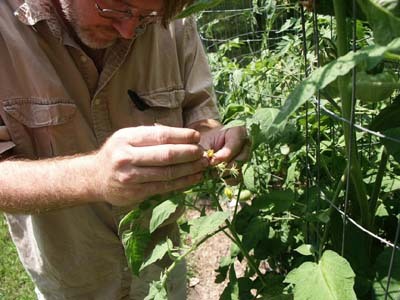 ����������� Note: because this man has developed interesting new strains of tomatoes, they look a little different than the kind you buy in the grocery store. Several varieties are purple, rather than red. Others are dark red instead of the rich, medium red color we all know. But rest assured: they taste fabulous, and they are very healthy! 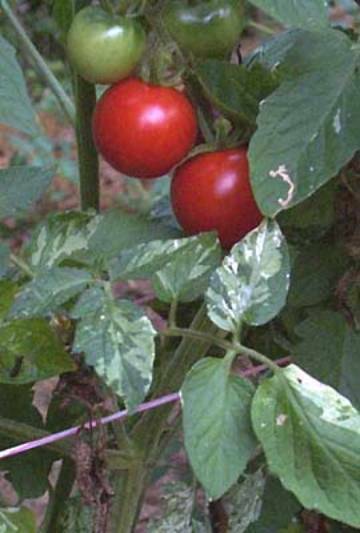 ����������� If you've never grown tomatoes before, now's a great time to start. It's cheap, and doesn't take that much space or that much time. Plus, it's tons of fun to grow your own food. ����������� You can tend them through the summer, eat them right off the vine and let the juice slurp down your chin -- !!! Then share them with your family, neighbors, friends and especially pantries and shelters for the homeless, where fresh fruits and vegetables are always welcome. ����������� Here's a good source to tell you everything you need to know to plant and care for tomato plants. Yummmm - can't you just taste that first BLT? (That's a Bacon-Lettuce-and-Tomato Sandwich - what some people say is a MUST for fresh tomatoes). Have fun, and thanks for helping this nice dad!